Greater Ancestors World Museum is now offering high-quality, hand-crafted fossil replicas. For instance, these are suitable for exhibit, or for home enjoyment. Replicas are great educational tools. For instance, good for getting out the message of greater ancestry. All fossil replicas are made by GAWM founder Chris Lesley, an award-winning sculptor and artist. A professional artist for more than 20 years. Chris Lesley has helped design and create museum and theme park features, including: life-size sharks, Megalodon Jaws, Top 7 Meg display case, whales, Dinosaurs, pirate ships and more. His work is seen in the Spy Museum in Washington. He has done work at the Atlantis resort in the Bahamas. Has made exhibits at the Universal Studios in Orlando and Ripley’s Believe it or Not museum. Has worked on a multitude of Margaritaville, Cheeseburger in Paradise restaurants and several IKEA stores in the United States and Canada. In addition, elongated human skulls, giant sloth claws, megalodon jaws, and more. Lesley also can craft fully custom pieces. Therefore, if you can imagine it, Lesley can create it – from teeth and claws to full dinosaurs and giant animals. See the online GAWM store for current pieces or contact Chris Lesley at greatorancestors@yahoo.com. 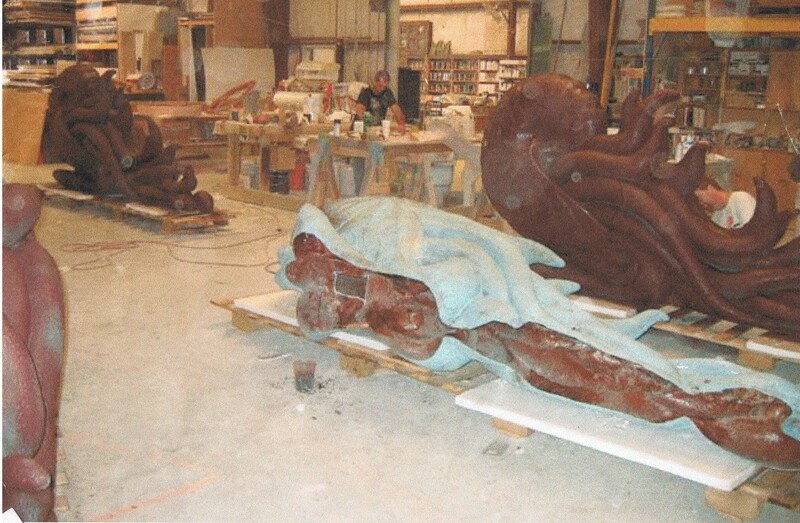 Chris Lesley (seen at right) fiber-glassing a giant nautilus fossil replica for the Atlantis resort in the Bahamas. nice website you have. i found it when i was looking for information on “The Bridlevale Falls Mummy” on google. i thought it was interesting because i run a website myself that also has the word ‘greater’ in it, and also deals with things that you never find in the mainstream media. even your design looks a bit like our site, with an ancient map in it. our address is http://thegreaterpicture.com/ . anyway, i just tought i’d say hi 🙂 i’m writing a new page on atlantis now, i think i’ll add a link to your site there, because it contains good information on ancient humans and technology.